An arithmetic series is essentially the sum of the terms contained in an arithmetic sequence. 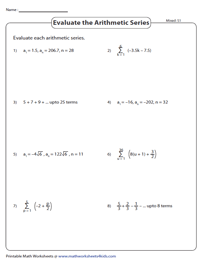 Get high school students to solve this exclusive collection of worksheets on arithmetic series. Knowledge of relevant formulae is a prerequisite to evaluate the sum of an arithmetic series and determine the number of terms. Word problems included. Click on the free icons to sample our work. Observe each arithmetic sequence. Identify the first term - 'a', common difference - 'd' and number of terms - 'n' and substitute in the relevant formula to determine the sum of the arithmetic series. 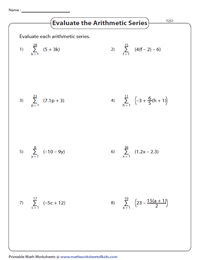 The arithmetic series in this set of worksheets is represented in summation notation (or sigma notation). 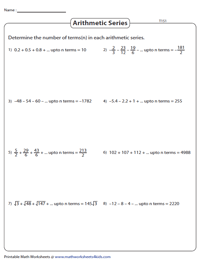 Evaluate each arithmetic series. Based on the first term, last term and the number of terms provided in the worksheets, find the sum of the arithmetic series. 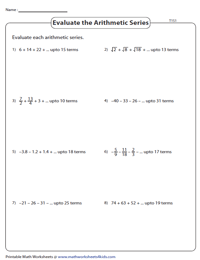 Assess your skills in evaluating arithmetic series with this batch of worksheets that is a blend of the Type 1, 2 and 3. You should be able to deftly switch between pertinent formulae to find the sum of the series. 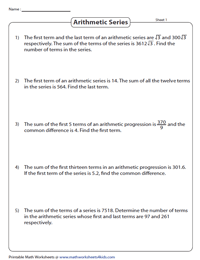 Identify the first term and the common difference for each given series. Substitute the known values in the appropriate formula to determine the number of terms 'n'. All problems in this set of worksheets are depicted in summation notation (sigma). Based on the given sums, apply the relevant formula to find the number of terms. Test a student's grasp in solving problems on arithmetic series provided in various formats. Validate your responses with the corresponding answer keys. 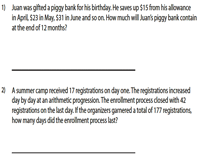 Solve this array of simple word problems to determine first term, last term, common difference or the number of terms. This set of worksheets contains well-researched real life word problems based on arithmetic series.